and once a Tiger, always a Tiger..even if a Mo type Tiger. Hey, the Man went like 16-2..beat Coots..scorched sassy Miami in ACCCG..had Clemson ranked # 1 in 4 Team CFP b/4 Bama used him & Team as scapegoats for DW4 & Hunter nipping them for 2016 Natty! Give it up, KB2 did us & himself proud. I agree. Not all do. But he led us to the playoffs . I get it the defense was great, yada yada yada and that is true. But as much as people want to revise history he was the starting qb as we made it to the final four and he took some pressure off Trevor having to come in and win at Texas A and M. I’m happy the other players were there to support him. ...critic Clemson "fans" on here. I love it. Classy move by his teammates. I’m thankful for Kelly’s contribution to our program. I know he’s young and got a little emotional in some of the things he said but it’s understandable being in his situation. I know there are lots of things I could’ve handled much better when I was that age too. He didn’t do a disservice to Clemson by pursuing an opportunity elsewhere. He’s making a move that he thinks could be an opportunity for his future. I can’t fault him for that. Wow. Really goes to show how well Dabo handled this controversy, despite many media outlets saying he handled it poorly. It absolutely doesn’t matter. At all. Clemson MEN just doing their thing. So maybe TNET can get over it now? I'll take " That's not mentally possible with some on here "
For 500 , Alex . Clutch post dug, ?? plus 1! Love this...great example of Clemson Family! This is great to see. Does anyone know if he got a national championship ring since he played a huge part in the Texas a&m win? was hoping the guys . . .
took his rings to him!!! Maybe they did it on the down low? Re: was hoping the guys . . .
Or Maybe they chipped in and got him a 4 game ring!!! 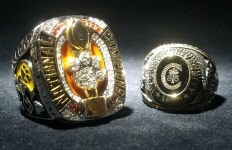 But a 4 game ring is better than any the coots have ever received I would believe!!! Highly doubt it. He quit in the middle of the season. I love KB and totally support him and always supported Dabo and crew starting him for the first 4 games last year but facts are facts. He quit. No ring. Like I've told a few in here, highly doubt he's getting one. He was a part of the team for 4 games, but fact is, he chose to LEAVE the team in his decision to transfer. He didn't stick with the team and just not play, he left it entirely after the decision was made.... Wasn't there for team meetings, wasn't on the sidelines in any capacity, even if to help his friends, didn't have any involvement with the team and wasn't on it at season end. That likely cost him from being able to get one. I think he implied in an interview last month that he didn't even want one. It doesn't matter what America thinks, only what Dabo and Kelly's brothers (especially the senior captains) think about it. Very cool. Supporting their friend. Had to be tough on KB to go out there not knowing anyone. I'll admit I had a knee jerk reaction when he decided to transfer. I hope he has a great year. Don’t wanna freak y’all out, but some of those guys don’t even go to Clemson!!!! How dare our players have friends who don’t worship Clemson!!! How did we ever whip Bama with such behavior?! If you can’t tell I’m being sarcastic. I love making fun of those of you who have an opinion about everything these young men do and say. Some of you are harder of them than your own kids. Re: Don’t wanna freak y’all out, but some of those guys don’t even go to Clemson!!!! Too true. Just got home from visiting one of my kids. Believe me, there's a lot to disapprove of once they leave the nest, but you do your darnedst not to push them away or they might just decide not to bother coming home. That's one of the most impressive things about these young men, to me. Sure, they're asserting some independence from their parents and becoming young men of conviction. But they are getting good advice from somebody at a time in their lives when they really need it. I'm glad that they are open to input from people who care about them, even if those counselors are old farts. IMO it’s the best way it could have been handled and none of us know how everything went down. I love seeing this. For all we know, KB might have gone to the team and told them the best thing he could do for them is quit the team and transfer. As it turned out, the best possible outcome for everyone. That's the most national champions that will be on that field for many years to come. Maybe I shouldn’t be but surprised Tee and Overton went to MO instead of going to Renfrow’s wedding. Now you have to know that they were!!! ....if they all flew that’s a nice investment in their brother! If they drove - wow - long road trip! Wondered the same thing myself. Wonder if it matters if they teleported?? Meanwhile, Ugay jail is full of football players and Usuc still sux. Go Tigers!! This is way over and above. Good for them, but he didn't deserve the gestures. He walked out of them, the team. I will never get over that in respect to KB. He did it, can't change that. True. Moreover, one has to be an idiot to have a problem with K Bryant. When we needed him he was there. When we realized we didn't we had TL backed up by Chase Brice. KB saved a year of eligibility. All worked out. What Cool-Aide are you drinking ? I assume you liked last years National Title? It was very close to not happening, don't forget that. Brice pulled one from the depths to keep us in contention. Bryant dropped us and didn't give a crappa about it. Don't forget this important part of the season. I won't. They went down just to show off their new NC rings!!! than he ever showed to them. God works through Dabo and in turn through many of his players. This doesn't at all change my position on KB. He abandoned the teammates and almost cost them a shot at the national championship. What this does is speaks volumes about the character of our players. KB should count himself fortunate that he has such friends. Is there risk of any leaving to end their careers with him? When players say Its like family at Clemson, this is what it means. This is what unconditional love looks like. Proud of these guys. With every opinion from everyone that has had a comment about these guys visiting KB2, there truly isn't a thing wrong with their continued friendship with KB2, and good friends will always support his friend, and I'm more than OK with it, really!!! Very cool. These guys obviously see the bigger picture. Class act by the Clemson Tigers, wish KB the best of luck in the coming season! Go Tigers! I wish Kelly all the best and hope he makes it to the NFL!